A re-make of the 1986 hit, which scored 80-percent in the Aizu district of Fukushima prefecture. 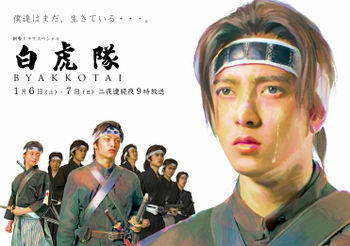 "Byakkotai" seems to be a story by which the content of the drama visits Byakkotai Memorial Hall by a modern young person who is the descendant of a Byakkotai samurai, and traces the history of the tragedy of the Byakkotai in the force organized by about 340 boys of 16 years old and 17 years old at Boshin War (Aizu war). Yamashita performs two roles (a Byakkotai samurai in the old days and the descendant, Shintaro Sakai).